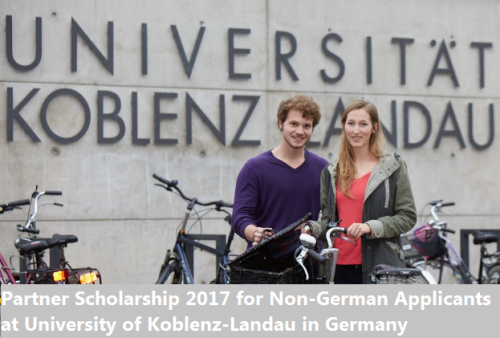 University of Koblenz-Landau is pleased to offer Partner Scholarship for 2017 entry. International students from partner universities (European and non-European) are eligible to apply for these scholarships to undertake MSc programme at the university. The primary aim of this scholarship is to support qualified international students financially during their first semester at the University of Koblenz-Landau so that they can settle in and get used to living and studying in Germany. Deadline: Ongoing (the scholarship is given on the “first come, first served” basis). Beneficiaries(Target Groups): Partner Scholarship for International Applicants are targeted for International students. Field(s): Scholarship is offered MSc in diverse fields like Ecotoxicology (Landau); Environmental Sciences (Landau); Mathematical Modeling of Complex Systems (Koblenz); Chemistry and Physics of Functional Materials (Koblenz); Web Science (Koblenz). ‣ Scholarship covers: Scholarship of 500 Euros per month will be awarded to the applicants. ‣ University of Koblenz-Landau is pleased to offer Partner Scholarship for International Applicants for 2016 entry. ‣ International students from partner universities (European and non-European) are eligible to apply for these scholarships to undertake MSc programme at the university. ‣ The primary aim of this scholarship is to support qualified international students financially during their first semester at the University of Koblenz-Landau so that they can settle in and get used to living and studying in Germany. ‣ The scientific profile of the University of Koblenz -Landau today is formed by the Educational Sciences, Humanities, Cultural, Social and Natural Sciences as well as Computer Science in Koblenz and psychology and environmental sciences in Landau. ‣ Applicants must have achieved very good grades (GPA of 1.9 or better) in their previous studies. The Programme is conducted in English. Therefore good active and passive English language skills are essential. Entrance Requirements: Applicants must have achieved good grades (GPA of 2,3 or better) in their previous studies. Language Requirements: The Programme is conducted in English. Therefore good active and passive English language skills are essential. ‣ The documents can be sent as an email attachment to the following email address: ishalaginova (at) uni-koblenz-landau.de. However, the original paper version of the application needs to be sent via mail in addition to the electronic version. Therefore, please send the application and all relevant documents by post. ‣ Scholarship Applications Due on : Ongoing (the scholarship is given on the “first come, first served” basis). Please note that application can only be considered if applicant submit a properly completed application form along with all the required documents within the given deadline. Now that all the information about Partner Scholarship 2017 for Non-German Applicants at University of Koblenz-Landau has been delivered nicely; talented students who are eager to pursue their Free Tuition/Scholarships/Study in Germany can apply now. Labels: Germany Scholarships, Master's Scholarship, Scholarship.